Documentum is an enterprise content management (ECM) platform that offers a wide range of document management solutions. The software boasts of numerous features apart from just providing file storage. It is able to keep up with content lifecycles with easy-to-use tools for organizing and controlling files. Captiva technology converts faxes and paper-based documents into information ready for different applications. Document Sciences technology lets users customize and personalize various avenues for communicating with customers. Business processes are automated with the help of Documentum xCP technologies. Users can retain, record, and specialize encryption and access with the application’s detailed security controls. 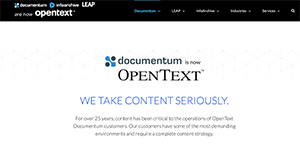 The Documentum software, as well as the company of the same name that first developed the technology, was acquired by OpenText from Dell EMC in 2016. Documentum aims to help companies rollout an effective content strategy that can keep up with their growing document management requirements. Documents are kept safe in the software’s organized and controlled repository. Users are able to retrieve and utilize important information whenever and wherever they need it, but without compromising privacy and security. Organizations can save time, efforts, and costs with Documentum’s Captiva feature. This technology converts paper-based documents into application-ready files, thus eliminating the need to tediously re-key information. With this feature, users also do not need to rely too much on courier services, which tend to take longer and can cost a lot of money. Document Sciences technology customizes and personalizes multi-channel customer communications. Whether via print, email, online, or mobile, distribution becomes more effective in terms of costs and time. As a result, companies can be more productive. Decision-making becomes more effective with the help of Documentum xCP technologies. These help automate information-heavy business processes and orchestrates them to be more efficient. Quality is not compromised and is kept consistent even though cycle times become much faster. Lastly, Documentum’s security controls ensure that content can only be accessed by the right users and controlled under corresponding policies. This way, business owners can be confident that files are kept safe. If you are interested in Documentum it could also be a good idea to check out other subcategories of Best Digital Asset Management Software collected in our database of SaaS software reviews. It is crucial to realize that hardly any service in the Digital Asset Management Software category is an ideal solution able to meet all the needs of various company types, sizes and industries. It may be a good idea to read a few Documentum reviews first as certain services can perform well only in a really small set of applications or be designed with a really specific type of industry in mind. Others can function with a goal of being easy and intuitive and consequently lack complicated features welcomed by more experienced users. You can also find apps that focus on a broad group of customers and offer a powerful feature toolbox, but that usually comes at a more expensive cost of such a solution. Be certain that you're aware of your needs so that you buy a service that offers all the features you look for. How Much Does Documentum Cost? Documentum pricing is not available online. However, interested buyers may contact their sales team for quote-based pricing options that will best suit their organization. We realize that when you make a decision to buy Digital Asset Management Software it’s important not only to see how experts evaluate it in their reviews, but also to find out if the real people and companies that buy it are actually satisfied with the product. That’s why we’ve created our behavior-based Customer Satisfaction Algorithm™ that gathers customer reviews, comments and Documentum reviews across a wide range of social media sites. The data is then presented in an easy to digest form showing how many people had positive and negative experience with Documentum. With that information at hand you should be equipped to make an informed buying decision that you won’t regret. What are Documentum pricing details? What integrations are available for Documentum? Documentum does not integrate with several applications. It also does not have an API available. If you need more information about Documentum or you simply have a question let us know what you need and we’ll forward your request directly to the vendor.